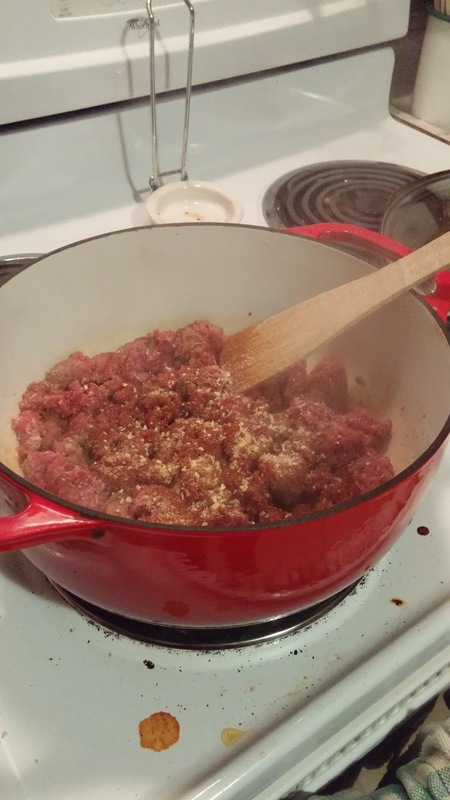 I also use two pounds of ground meat in my recipe. 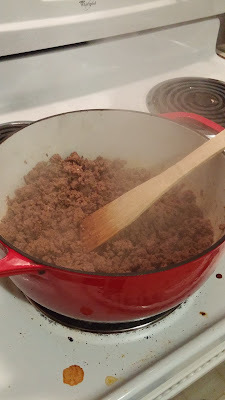 I usually use one pound of ground beef and one pound of ground pork. You can use whatever you like. This is good with all ground beef, all ground pork, with ground venison, and/or ground turkey. 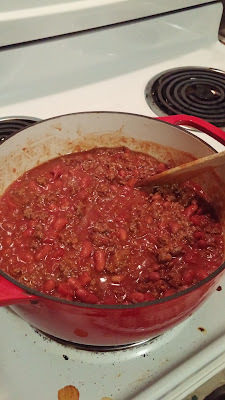 You can cut back on the meat to only 1-1/2 pounds of ground meat, but I like my chili to be more like stew instead of soup. So I use more meat. The tomatoes can also be played with a little. I usually use a 28 ounce can of crushed tomatoes. 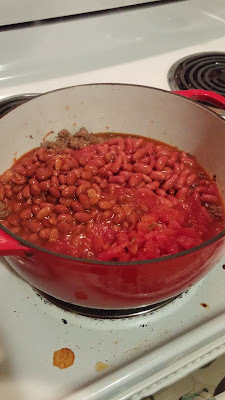 I have also used a quart jar of home canned crushed tomatoes or whole tomatoes. If I use whole tomatoes, I just crush them with my hands before adding them to the pot. If you are accommodating the picky people in your life (no judgment from me on this! ), you can use a 1/4 cup of dried minced onion instead of using the fresh chopped onion. You can also use 1/2 teaspoon of garlic powder instead of minced fresh garlic. 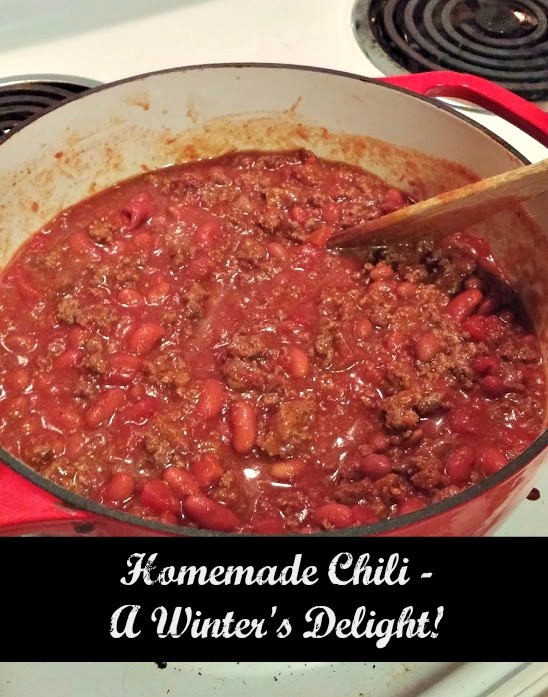 You can also make them on the stove or put in the slow cooker on low all day! Didn't I say this was versatile? Brown the meat with garlic and onion. If you using the dried versions of garlic and onion, you can still add them now. If you cooking this on the stove, brown the meat in the pot you are using to make the chili. I usually use my 6 quart cast iron enamel pot. If you are using the slow cooker, just brown the meat in a frying pan. After the meat is browned, you can drain it if you would like. I don't usually drain my meat unless the meat is swimming in the grease. I like the favor the grease adds and I don't usually have a lot of grease in the pan. If you are making this on the stove, add the seasonings and the canned goods to the pot. If you are making this in a slow cooker, you can add the meat, seasonings, and canned goods to the slow cooker. Stir well. Bring the chili up to just a boil and then turn it down to low. Cover and simmer on low for a hour or longer if you want. With the slow cooker, set it to low and let it cook for 8-10 hours. Although, we have ate it after 4-6 hours with no problem. This serves at least 4-6 people. We serve it with cheese, crackers, and sour cream. I also apologize for the splatter stains on the stove. Just keeping it real. Normally, the stove is a lot cleaner!